During NASA's Cassini mission's final distant encounter with Saturn's giant moon Titan, the spacecraft captured this view of the enigmatic moon's north polar landscape of lakes and seas, which are filled with liquid methane and ethane. Punga Mare (240 miles, or 390 kilometers, across) is seen just above the center of the mosaic, with Ligeia Mare (300 miles, or 500 kilometers, wide) below center and vast Kraken Mare stretching off 730 miles (1,200 kilometers) to the left of the mosaic. 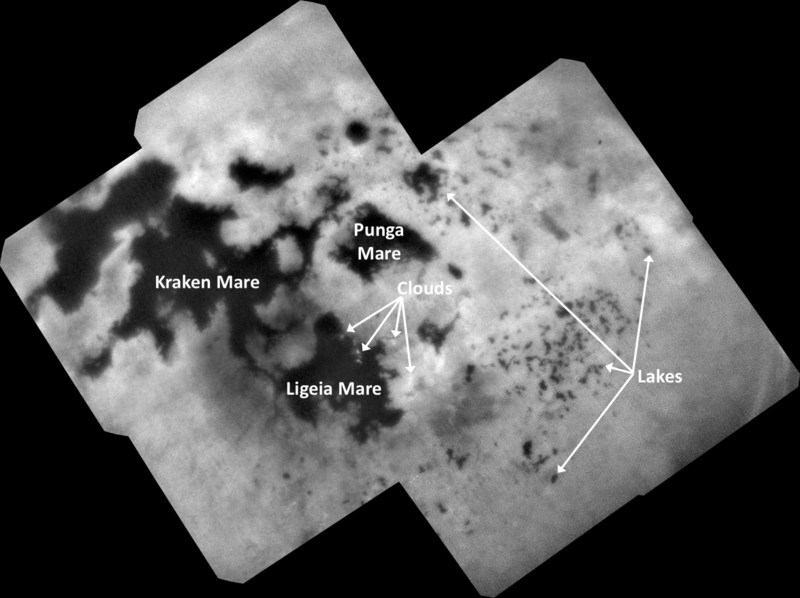 Titan's numerous smaller lakes can be seen around the seas and scattered around the right side of the mosaic. Among the ongoing mysteries about Titan is how these lakes are formed. Another mystery at Titan has been the weather. With its dense atmosphere, Titan has a methane cycle much like Earth's water cycle of evaporation, cloud formation, rainfall, surface runoff into rivers, and collection in lakes and seas. During Titan's southern summer, Cassini observed cloud activity over the south pole (see PIA06112 and PIA06109). However, typical of observations taken during northern spring and summer, the view here reveals only a few small clouds. They appear as bright features just below the center of the mosaic, including a few above Ligeia Mare. The images in this mosaic were taken with the ISS narrow-angle camera, using a spectral filter sensitive to wavelengths of near-infrared light centered at 938 nanometers. They were captured on Sept. 11, 2017, during Cassini's last encounter with Titan. Four days later, Cassini was deliberately plunged into the atmosphere of Saturn. The view was obtained at a distance of approximately 87,000 miles (140,000 kilometers) from Titan. Image scale is about 0.5 miles (800 meters) per pixel. The image is an orthographic projection centered on 67.19 degrees north latitude, 212.67 degrees west longitude. An orthographic view is most like the view seen by a distant observer looking through a telescope. For more information about the Cassini-Huygens mission visit https://saturn.jpl.nasa.gov and https://www.nasa.gov/cassini. The Cassini imaging team homepage is at http://ciclops.org.